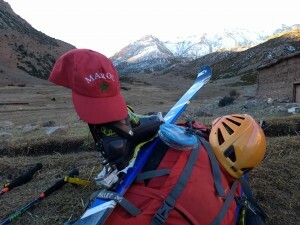 Hi All, this past February/March, Antoine and I went ski mountaineering in Morocco. I've put the trip itinerary and some pictures below for your interest, and we're happy to share further information if you would like to go to this area. It is ripe for skiing, mountaineering and climbing (winter climbing, trad and sport). Saturday 23 Feb: Arrive Marrakech, buy campingaz (easy), stay at Medina hotel in Marrakech, Group dinner and buy snacks. Sunday 24 Feb: Moroccan breakfast, morning depart with driver (Idris) to Agouti, buy gasoline near Agouti for stove, drive to Ait Sa’id. Load packs and walk up to Azib Ikkis. Before village stop and camp (at first house along the path). Ask farmer if it’s ok to camp, and he says yes. Spring for water next to farm. Monday 25 Feb: From camp walk up to Azib Ikkis, turn right upt the pass. Met party of French people (~9 people plus Moroccan porters) from Toulouse. 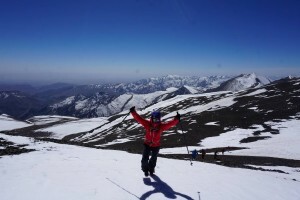 Where path turns left up to Tizi-n-Tarkeddit we put skis on and skin up. Skins off at top and walk down to Tarkeddit refuge. Set up camp next to little hill north of the refuge and next to spring. Tuesday 26 Feb: Pack up and hide Tarkeddit camp. 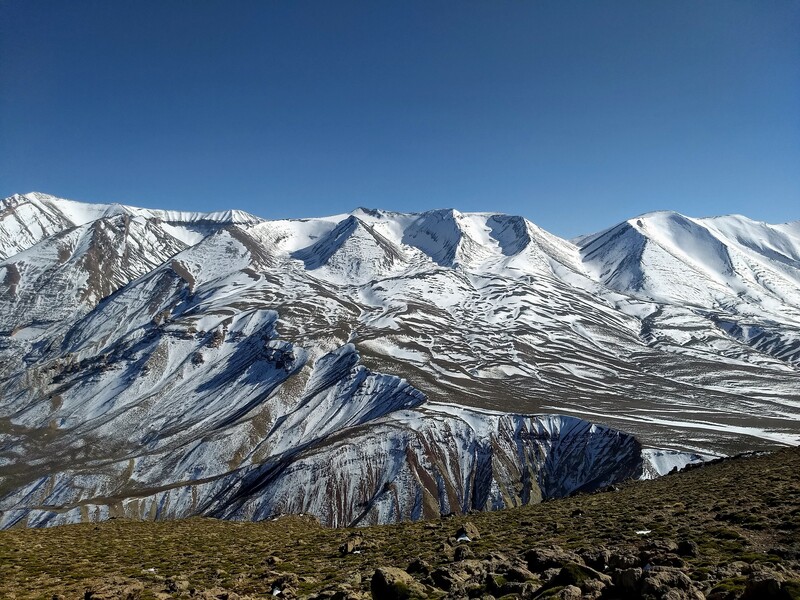 Take path up pass to Tizi-n-Iquandoul. Skis on after about 45 minutes. Up the pass and take skis off on South side (views of Sahara). Walk on ridge with snow patches to M’Goun West (3978m). Walk down, skis on and ski down pass. Same camp. 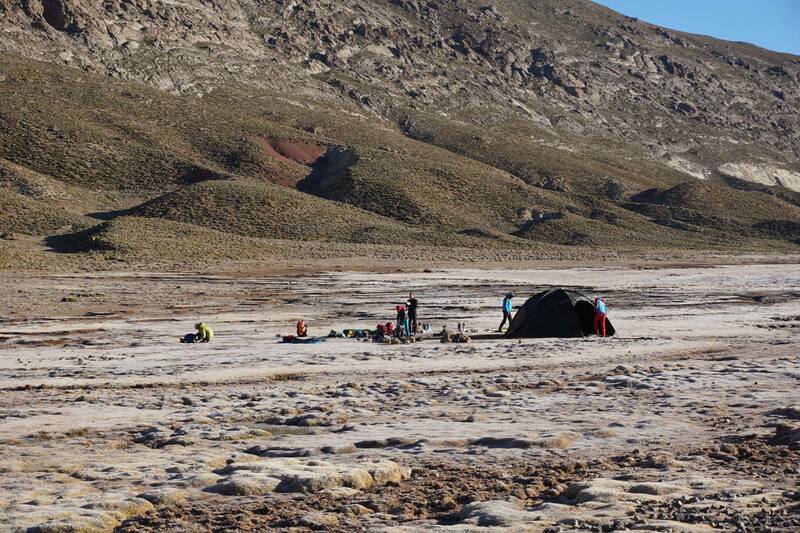 Wednesday 27 Feb: Pack up and hide camp again. Walk West to Tizi-n-Oumsoud. 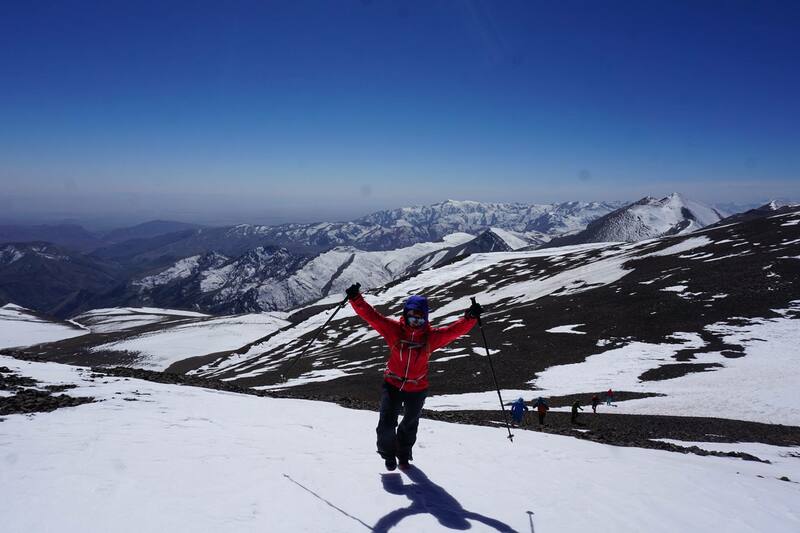 Nico, Sev and Tanguy come about halfway and return to have a day on the plateau. 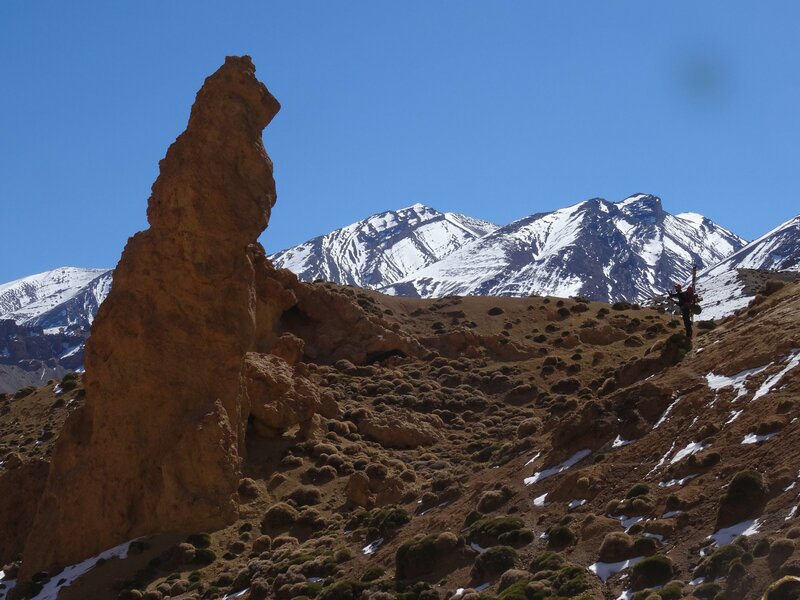 Coline, Antoine, Kevin and Andrew continue up Western ridge of Adrar-n-Nig Oumassine and traverse East into gully below 2nd grouping of blocky boulders before reaching Tizi-n-Oumsoud. Tough traverse in thin snow but find great snow in the gully. Good ski and walk out of hidden canyon. Same camp. 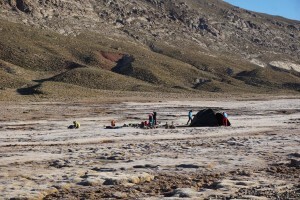 Thursday 28 Feb: Pack up camp and move East out of valley with refuge (rest of trip on foot). Trails on piolet map are not well marked but find way down in gorge until forced up and right (in South direction) to sheperd’s plot with big rock in it. Then over this ridge and to to follow the river East again. Into Gorges d’Arous and climb steeply up on East/NE aspect. 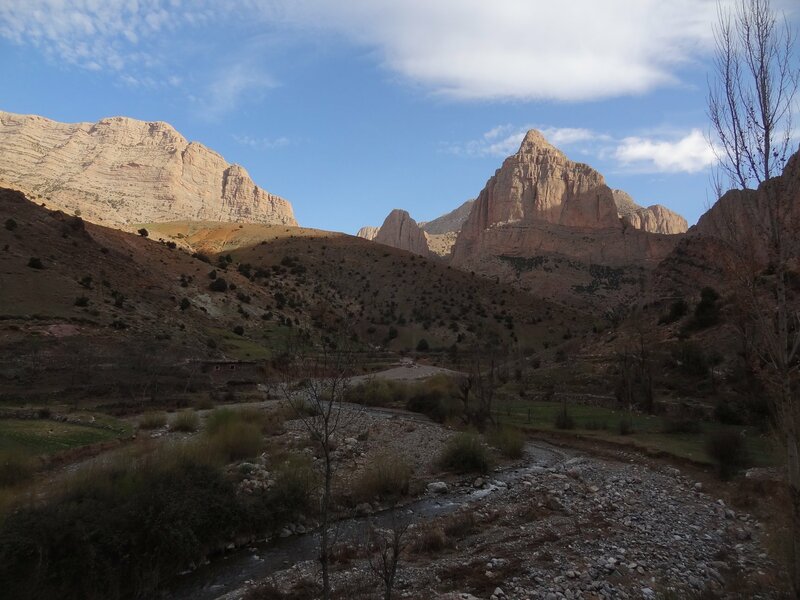 Follow ridges NE to shepherd’s camp and set up our camp here before reaching Tizi-n-Tanout pass. Beautiful camp. Friday 1 March: Traverse to Tizi-n-Tanout and follow valley down to Azib Tifratine. Beautiful lush valley and river. Lunch by the river (the Pasta Valley). Call Mostafa and just get a signal to arrange pick up at the pass. In the sandy flat with giant rock formations see first person since Monday (Berber farmer). Ascend at Berber house to road above with regular bus passing by. At road walk up to pass Tizi-n-ait-imi and wait for van from Mostafa. Drive to Zawyat Ahansal and stay at Gite Muhamed. Tagine, showers, bed, sleep. Saturday 2 March: Walk from gite to Taghia (would be an amazing rock climbing venue for the next visit! 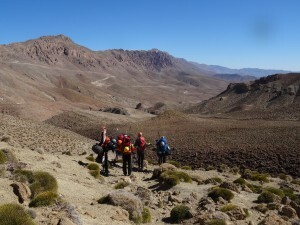 ), scramble up left gorge, back for tea, cake and more tagine. Taghia, we will be back for you...with a trad rack! Sunday 3 March: Drive from ZA to Marrakech. Stop at Berber market along the way. Antoine and Andrew fly away. The rest stay at hotel Medina and fly back on Monday 4 March.